COLD spring harbor, ny custom Gunite Pool & Spa combo. When your client sets forth guidelines for his project such as wanting a resort style feel, a Hampton-esque look, form, high function and most importantly, show stopping beauty, Platinum’s team of designers had to dig deep into their resolve and were able to bring up this winner. 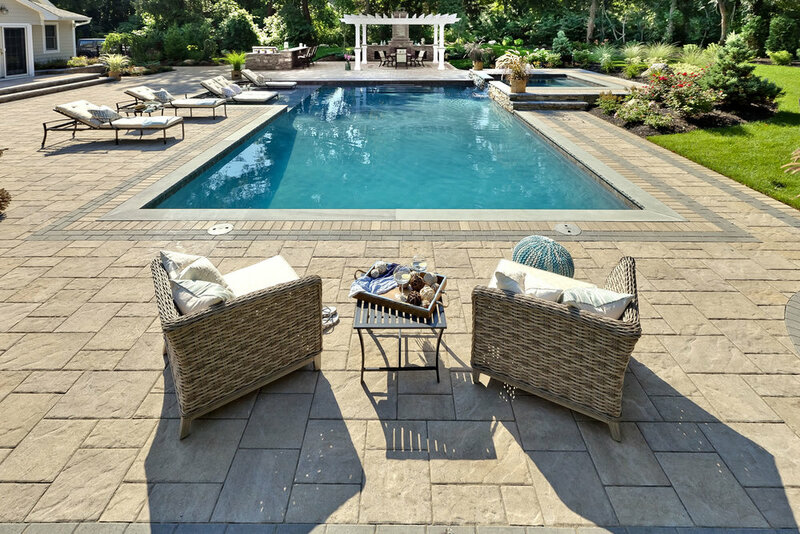 The dimensions of the main pool are a modest 20’x40’ but when incorporated with an 18’x9’ sundeck and a massive 10’x12’ spa, this pool and spa combo dwarfs most. The spa boasts 12 hydrotherapy jets, two custom hydrotherapy lounges, LED lighting throughout, and full spa-side controls. Coupled with the massive 16-foot-tall fireplace, custom built pergola with bluestone accents that sits approximately 20 feet wide and a grill island complete with a 42” Wolf range, this project is inspiring from first glance.